About “Charanams” – The Ragas & Rhythms! “Charanams” is a young, world music, cross-genre band that performs a blend of carnatic (South Indian classical) and jazz style. The music presented by “Charanams” is original, creative and unique. “Charanams” performs original compositions of Nivedita ShivRaj based on Indian ragas and traditional carnatic compositions blended with jazz style and contemporary rhythms. The vibrant and universal music of Charanams’ appeals to music lovers of all ages and ethnicity. Charanams band members are dynamic, creative, fun loving with a passion for music. Each one of them is a professionial in his/her chosen field. We come together to create melodious, rhythmic music, that is loved by their fans and music lovers. Nivedita ShivRaj – veena player and a vocalist, is a composer, performer, teacher of carnatic music. 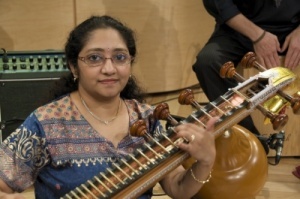 She composes original music; presents concerts and workshops; teaches music (both vocal and veena) in the USA and other countries.She plays the south Indian multi-stringed instrument “Veena” She has worked on several cross genre projects, recorded with Saxophonist Andrew Sterman, rock band “The Ocean band”. She has created music productions combining carnatic style with electro acoustic music. Also, visit Nivedita at www.NiveditaShivRaj.com. Jason Goldstein is from New York. has a Bachelor of Music Degree from Northwestern University. He has played throughout the Chicago and New York areas. He has appeared at numerous venues such as the Hot House and the Chicago Cultural Center in Chicago and Puppets Jazz, The Living Room, Ella Lounge, and Flushing Town Hall. Jason performs as sideman to many artists and leads his own jazz trios. Jason can be heard on the recently released “Music Therapy for Memory” CD. Sam (Samyuktha) ShivRaj is a young talented, versatile vocalist, trained and proficient in carnatic music and western popular music. She sings, pop, rock, bollywood and carnatic styles. She performs regularly in various TV shows. She also plays the piano and guitar. . A rigorous music training in both the western and the South Indian music has given her the unique ability to blend the best of both forms. She was a soprano in high school chorus and the All City New York Hish School Chorus. 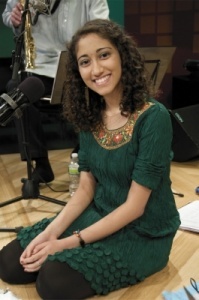 She has performed in several venues in the tri-state area such as Carnegie hall, Gracie Mansion, Flushing Town Hall, Indian Consulate, Queens Library . She hosts her own live TV show “India Talks”, that has earned her huge fans. Bollywood Actors, Singers, Musicians, Attorneys, Heads of Charity Organizations, Writers, comedians have been guests on her show. She is also the host of the TV show “RagaChitram” the exclusive show for Indian classical music & dance. 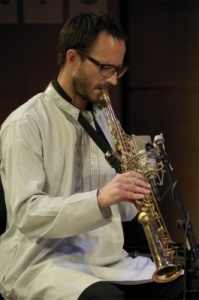 British saxophonist Marcus Cummins has been associated with the UK free and improvised music scene since the early 90’s. He has worked extensively as a solo artist, in duo’s and larger bands but is perhaps best known internationally for his involvement in Trevor Watts’ ‘Celebration Band’. Born in London he joined the afro – jazz band ‘The Hamptons’ who he played with in bars and clubs around London and the south east. Cummins then studied music formally at Leeds City College of Music and Dartington College of Arts. During this time studying primarily jazz and Indian music (with the council of many masters such as Bobby Wellins; Evan Parker; Paul Dunmall and Dharambir Singh) he developed a personal style unlike that of any of his contemporaries. He has performed in a wide variety of arenas from traditional jazz clubs such as Ronnie Scotts, London to more ‘improvised’ music festivals such as ‘Edgefest’, Ann Arbor, Mitchigan. 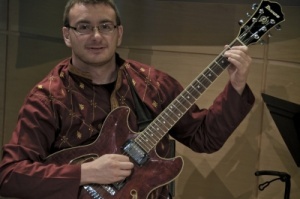 From 1999 to 2005 Marcus Cummins played and toured throughout Europe, Canada and America with Trevor Watts’ ‘Celebration Band’ and the London based ‘Rosie brown’ group. He has performed on radio and television, won awards, bursaries and commissions and worked for the British Arts Council and the BBC. He currently lives and works in NYC while continuing to work with long time musical associates from Canada and Europe, ie. ‘Snowcycle’ based in Europe. Born in Montgomery, Alabama, Tripp Dudley has spent most of his life pursuing his musical journey. He started snare drum in his junior high school concert band. and then progressed to playing timpani and drumset. Tripp graduated from Berklee and started teaching privately at a local studio in Alabama and toured with a band called Highly Kind. After a year in Alabama he decided to move to New York to pursue more expansive musical experiences. Once there, he really started discovering the beauty of tabla, and his days started involving 10 hour-long practice sessions. He is now a student of Samir Chatterjee. 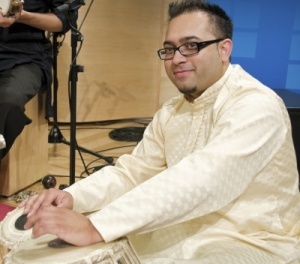 He now resides in Manhattan where he plays drumset, tabla and percussion with numerous artists ranging from hip-hop, jazz, Indian classical, rock, latin, singer-songwriters and his own fusion of world styles. He’s been on tours all over the USA and the UK and Ireland. 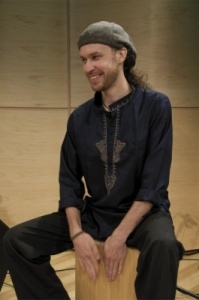 Some of his current projects are PremaBhumi, a sitar and tabla duo and KaleiDhaPhonic, an mbira and tabla duo. He also plays drumset, tabla and percussion with singer-songwriter Beth Nielsen Chapman, who has written songs for Faith Hill, Willie Nelson, Martina McBride, Michael McDonald, and Elton John. n all genres of Indian music including Hindustani classical, ghazals, qawalis, Hindi film, and devotional. He also received more advanced training from Ustad Tari Khan while his stay in Chicago, IL. He has also accompanied famous icons such as music director Nisar Bazmi and sitarist Ustad Nafiz Ali Khan. He later formed the group RIYAAZ with some of his friends incorporating Hindustani classical, with Carnatic, with jazz. Advait has also had the opportunity to attend advanced level workshops taught by Ustad Zakir Hussain. Aside from the tabla, Advait plays the guitar, piano, sitar and sings everything from old film songs to ghazals to newer songs.